After scorching heat, the much-awaited season is upon us. Rain showers from the heaven in a true sense. The downpour induces new life everywhere, the lush greenery, croaking of the bullfrogs and Petrichor which is the most mesmerizing fragrance of wet earth. But as rains cause these awesome things, the downpour also creates certain obstructions in our daily lives. One such obstruction is driving in heavy rains. The challenging driving conditions you face in heavy rains are low visibility, high winds, and slippery roads. But if you master the skill of driving in these conditions, you will overcome the challenges posed by rains with a wide smile on your face. 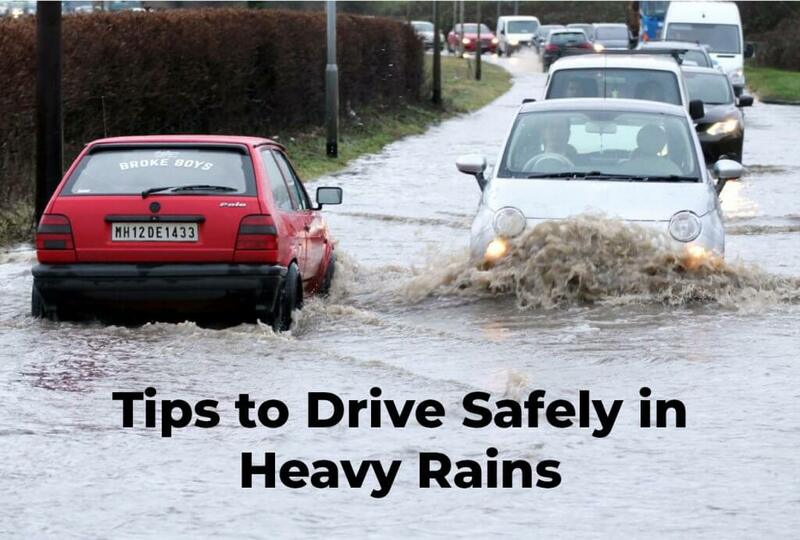 Let’s see how you can drive in heavy rains with ease. Visibility can alarmingly drop down to 5 -10% during very heavy rains. If rains are accompanied by thick fog, the visibility could become nil. Driving in such conditions can be fatal if the driver is not fully alert. The first thing to do in this condition is to keep the volume of music down, if not just be alert and try to hear any honking from another vehicle. Secondly, use fog lights along with low beams. Using high beams can cause the light to reflect resulting in distraction. Keep the car’s speed at least 10 to 20 kilometers less than the prescribed limits. Rains along with high winds is a deadly combination. You could easily lose control and swerve in an unwanted direction. In this situation, you need to keep a firm grip on the steering wheel. In any case, avoid driving next to heavy vehicles like trailers, tankers, trucks, etc. In high winds, exerting control over these vehicles becomes a task. The drivers of these vehicles may not be able to control their vehicles if you collide with them. Also, be extra cautious while driving down a slope in heavy winds. You could be pushed forward with a gust of a strong current which could increase your speed. Nowadays cars come with an inbuilt feature of Traction control. This helps a driver to maintain control over a car on slippery roads. You can still try and gain control of your car even if it does not have this feature. If your car is skidding off course, you need to turn your steering wheel in the direction of the skid. This is called driving into the skid. When you drive into the skid, it will straighten giving you control over the vehicle. One can easily overcome tough situations like driving in heavy rains and wind on slippery roads with a calm mind. The idea is to not lose control of the car and reach your destination safely. Apart from learning these skills, you also need to make sure that you protect yourself from any financial crisis arising due to your car. These could include flood water entering your car and damaging the engine or a tree falling on the vehicle. To be able to pay for these damages you will need a Comprehensive Car Insurance policy. Remember to protect car with insurance irrespective of the weather.